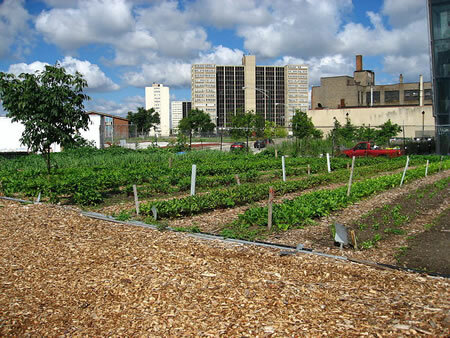 According to a study by Michigan State University researchers, the city of Detroit could harvest 75% of the vegetables and 40% of the fruit that it needs for residents right within city limits. Detroit is tearing down the metal and concrete of industry and apartments, and revealing the good earth. “Our totals are conservative,” Mike Hamm, a professor of sustainable agriculture at Michigan State University told the New York Times. “But it may be closer to representing the quantity of land more readily available for urban farms and gardens because these parcels are publicly owned and clear of any buildings.” The Michigan State University study considered 44,000 empty parcels of land owned by the city totaling 5,000 acres (excluding parks, golf courses, rights of way and private property), and then applied the national produce consumption levels to arrive at their estimates. Until the decay of the Empire eventually reached it... its drooping powers had been bent back upon themselves and broken forever. In the blasting ruin of death, the metal shell... wrinkled and crumpled into an aching mock of its own grandeur. The survivors tore up the metal plating and sold it... for seed and cattle. The soil was uncovered once more and the planet returned to its beginnings. In the spreading areas of primitive agriculture, it forgot its intricate and colossal past.